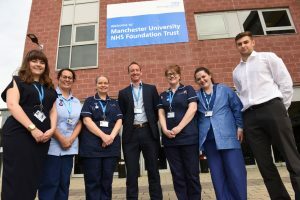 Dr Matt Evison, Consultant in Respiratory Medicine at Wythenshawe Hospital, said, “It’s hugely exciting that Manchester is the first place in the UK to offer this support to smokers. A stay in hospital is often a time where people focus on their health, whether or not they’re being admitted for a condition related to their smoking. There is no greater step a smoker can take to improve their health than stopping smoking. But nicotine is highly addictive and smoking is a hard habit to kick without support and medication. “Many smokers don’t fully appreciate the strength of tobacco addiction. This is a physical disease where the brain becomes dependent on nicotine. Without nicotine, a smoker will suffer intense withdrawal symptoms and that’s why it’s so hard to quit smoking without help. At present, most patients with an addiction to tobacco are not offered help, support or treatment when they are admitted to hospital in the UK. Mayor of Greater Manchester, Andy Burnham, said: “Smoking remains the biggest single cause of early death and ill health in Greater Manchester. The CURE Programme is part of our wider ambition for Greater Manchester to be the first city-region in Europe to make smoking history. Greater Manchester Health and Social Care Partnership’s Director of Population Health, Sarah Price, explained, “We have ambitious targets to reduce smoking rates in Greater Manchester by a third by the end of 2020. This will only be achieved through innovative but tested approaches like the CURE Programme. The launch of CURE has been welcomed by the UK’s leading expert on tobacco addiction and smoking cessation. Professor John Britton, Director of the UK Centre for Tobacco and Alcohol Studies and lead editor of the 2018 Royal College of Physicians report ‘Hiding in plain sight: treating tobacco dependency in the NHS’, said: “I welcome the launch of the CURE programme, which is an example of true leadership in delivering the smoking treatment services in secondary care that have been recommended for some time by the Royal College of Physicians, NICE and other organisations. Once embedded in hospitals across Greater Manchester, CURE aims to support over 18,000 people to successfully quit smoking, and save over 3,000 lives in its first year alone. The CURE Programme is estimated to deliver savings of nearly £10 million per year, reducing hospital re admissions and releasing around 30,880 bed days a year across Greater Manchester. This is equivalent to 84 additional beds per day across Greater Manchester.